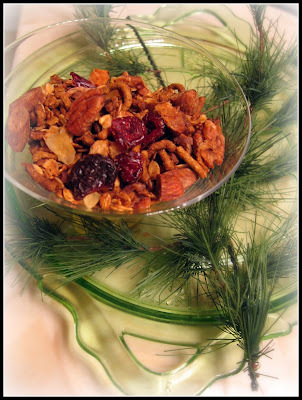 Christmas-y granola full of spices, dried fruit and nuts. stirring every 10 minutes. Remove granola from oven; cool completely in pan. Stir in cranberries, figs, and fruit. Eat. 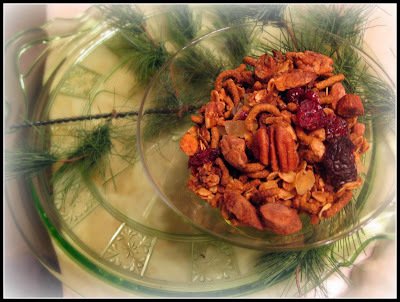 13 comments on "Christmas Granola"
Oh, great! Now I'm worried that you'll try one of the recipes I've posted and hate it!! I guess this is a time to be grateful that I'm not creative enough to come up with my own recipes, because at least if they don't work, it's someone else's fault! Your granola sounds wonderful! I've never made my own before. So you know I'm going to try that chocolate pixie recipe this weekend. I just have to. The fudge, I'm not a fan of fudge and have actually never made it, so if it turns out crappy I won't know how much of it's my fault. But cookies, those I know I can make. I seriously have nothing to do and I have an hour and 5 minutes left in here. I can't wait to get home. I just realized I can watch movies online on this computer. I wish i would've figured this out earlier. Deb- I'm totally blaming it on you, if one of your recipes doesn't turn out. Example: cornbread. Amy- NO AMY! AMY, NO! Don't do it! Please, try another recipe. You're going to have to add quite a bit of flour to be able to work with the dough. Hannah (ANON)- Congrats on your last day of school! You should start a blog, to celebrate. Sorry your cooking day wasn't up to your expectations. I hate those kinds of days. This recipe is right up my alley. First off, I love granola. Second, I love Amaretto. And pretty much everything in the recipe. I will try this one for sure. Thanks for the excellent and trustworthy recipe. Btw, I totally just wasted my time and ingredients on a bad coconut macaroon recipe. Ugg! I tried to fix it half way through and it got a little better but not what I wanted. Oh well, that's cooking for you. Trial and error. Tracy- Yeah, it's really frustrating. Annie- Sorry about those macaroons. This tastes good. You might want to make it a 300 F for 1hour, because mine got dark towards the end. I think 350 might be too hot. It should be fine, if you keep an eye on it, which I did not. Dhanggit- That EAT thing was for Amy, a little joke. I don't know HOW a fudge recipe COULD be bad. Couldn't you just pretend it was big wadge of chocolate and butter and eat it with a spoon? i hate about.com - worthless! it's ok to have cooking failures, hopefully you learn from them. it's the worst when a recipe seems wrong but you follow it anyway, and then it flops. better luck in 2008! those truffles look SO good. This is the first time I've read your blogs and it won't be the last! Your Christmas Granola surely must be a treat...I could almost, but not quite taste it with all the flavors bursting out! I am going to write it down! 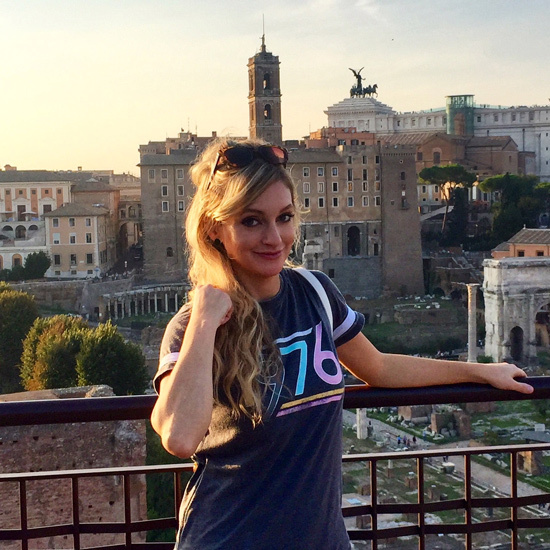 You are going into my favorites with a few other blogs! Thank you for all the time and effort you put into your blogs!